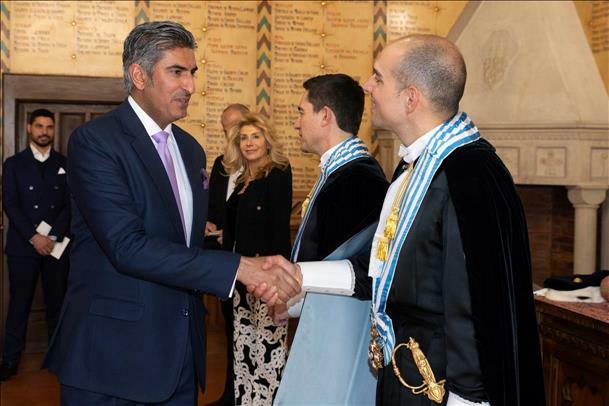 (MENAFN - Kuwait News Agency (KUNA)) ROME, April 5 (KUNA) -- His Highness the Amir Sheikh Sabah Al-Ahmad Al-Jaber Al-Sabah congratulated the newly-elected Captains Regent of the Republic of San Marino Nicola Selva and Michele Muratori. The Charge D'affaires of Kuwait Ambassador to the Republic of San Marino Sami Al-Zamanan conveyed congratulations of His Highness the Amir and His Highness the Crown Prince Sheikh Nawaf Al-Ahmad Al-Jaber Al-Sabah to San Marino's new heads of state, Kuwaiti embassy stated to KUNA Thursday night. His Highness the Amir and His Highness the Crown Prince also wished Selva and Muratori, who succeeded Mirko Tomassoni and Luca Santolini to the post, best of luck and success on their new term, and further progress and prosperity for San Marino and its people. Al-Zamanan affirmed to San Marino's heads of state his country and government's keenness to boost and enhance friendship with the Republic and bolster bilateral cooperation in various fields and on all levels. For their part, Selva and Muratori expressed their gratitude to Kuwait for its presence at their inauguration ceremony, as well as their utmost greetings to His Highness the Amir. They also expressed their grand appreciation of His Highness the Amir for his humanitarian role and pioneering efforts worldwide, and for Kuwait's regional and international status. The two heads of state also expressed their country's desire to strengthen and enhance bilateral and diplomatic cooperation with Kuwait at international arenas.